Happy Tuesday! I’m back with another build-a-scenery card. This time it is an underwater mermaid scene. Mermaids are such beautiful creatures (if only they were real) and when I saw this stamp I knew I had to have her, she is absolutely stunning. SumMore Fun has some amazing scenery stamps and I can only hope to own them all one day. I love that with these stamps I have so many options when it comes to creating a beautiful scenery and that I am not tied down to one image. For this card I stamped all my images onto a piece of Canson 90 lb watercolor paper and painted it using Prima Watercolor Confections. I painted some Shimmer into the mermaid using pearlescent watercolor, (the cheap stuff from Joann’s). I did mask off parts of the stamps used to create the ocean floor. To do that before inking my stamp, the areas I did not want to stamp I covered with tape, and after inking and before stamping down I removed the tape. I embellished my underwater scene by hand stitching some tan twine and then adding some washi. I decided to add some black trim to the side which was cut with a metal die for my craft stash out of a piece of black cardstock. The sentiment “SWIMMING BY TO SAY” was hand punched with some letter punches that I bought so many years back. I then attach the letters to my scene after running them through an Xyron sticker maker. I felt that sentiment was perfect because the mermaid looks as if she is waving at you. 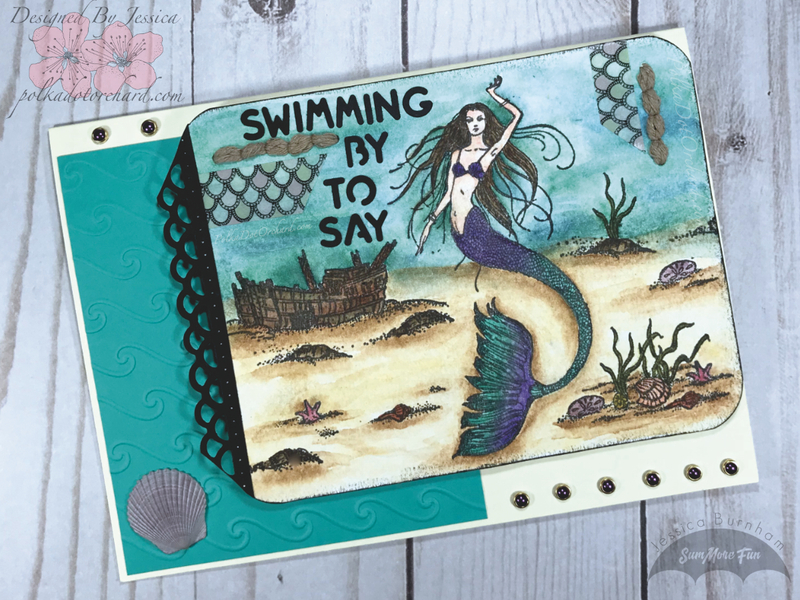 The wave embossed cardstock was created with a Darice wave embossing folder and my Sizzix BIGkick. I attached that to my card front first followed by attaching my foam mounted underwater mermaid scene. I also added a real seashell to the corner of the card. Yes, that seashell is actually purple and oh so pretty. Now, for the inside I wanted to make it look as if the mermaid was swimming around so I did some partial stamping. 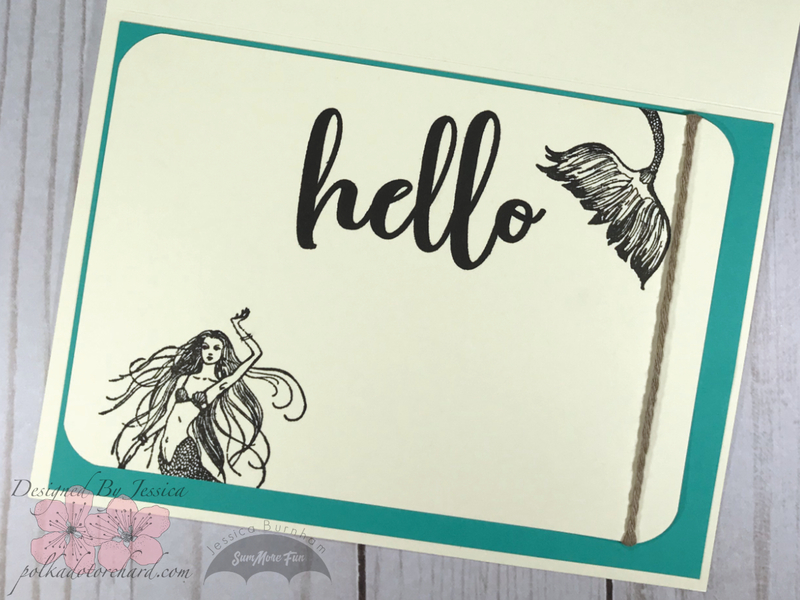 I love the look of the large bold single word stamps like the “hello” stamp I used here (hello is a single word stamp by Honey Bee Stamp). I finished up by wrapping some twin at the edge of my panel. Well, that is it for todays post, I hope I have inspired you in some way and that you decide to give scenery building I try. This really turned out AH-MAZING!! The Scene is Fantastic and wonderful coloring! !